When we Glorify Death More Than Life | Smile, God Loves You! I read this very recent article by Franklin Graham and the urgency of the message has jumped out at me, so I am sharing it with you. Hollywood is getting rich from creating movies and television shows that glorify death. It turns death into entertainment that excites people and literally pulls them away from God. It’s obvious that the return of Christ is very near when so many people are captivated with evil rather than with good. They need Christ and they need to repent and turn away from this fixation. They need to see that the horror Hollywood portrays – even as ugly and hideous as it makes it look – is nothing in comparison to the reality of the punishment that unbelievers will receive when they face God on Judgment Day. Death is not a joke and it’s not something that anyone should accept as entertainment because one day they just may live in eternity the life that captivated them here on earth. And that is scary! Read Rev. Graham’s message and see what I mean. Sunday night NFL football has been a favorite television staple for several years, but on at least two occasions this past fall, it was definitely a second viewing choice for millions of Americans. Instead of watching footballs fly, 17 million viewers chose to watch the season premiere of The Walking Dead, a series featuring foul zombies creating endless havoc. Just a few weeks later, nearly 15 million people tuned in to yet another episode, easily surpassing that night’s matchup between the Denver Broncos and the Kansas City Chiefs. That program is just one of numerous television programs that have garnered tremendous followings by fixating on gore and death. At least half a dozen prime time shows are strangely enamored and captivated by it. These shows, when combined with hugely popular video games like Mortal Kombat, demonstrate how obsessed with death our culture has become. However, despite our society’s fascination and obsession with death, there is virtually no understanding of the eternal consequences that death brings. Amazingly, as much as the entertainment industry cranks out movies and programs that are preoccupied with death scenes and motifs, death is not a subject often candidly discussed. I think that’s because we would prefer to portray death on a purely fictional level and avoid its stark reality. The Bible says that once a person dies, he will face the judgment of God. 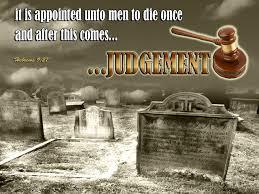 “It is appointed for man to die once, and after that comes judgment” (Hebrews 9:27). There is no reincarnation. There is no second chance. Death is serious, eternal business. Once our physical hearts beat for the last time, we will instantly find ourselves either in the presence of the Lord Jesus Christ in all His splendor, or in the pit of hell away from His presence. “They [those who do not know or obey God] will suffer the punishment of eternal destruction, away from the presence of the Lord and from the glory of His might, when He [Jesus Christ] comes on that day to be glorified in His saints, and to be marveled at among all who have believed” (2 Thessalonians 1:9-10). Death is not a fictional television series. It is not a popular gaming topic. It is the entryway into either eternal life or eternal death. And a culture that treats it as mere fantasy and amusing entertainment does so at its peril. The Scripture is clear that death is a consequence of sin. It came as a result of mankind’s rebellion against God in the Garden. Adam and Eve were fully warned of what would happen if they chose to disobey God’s instruction not to eat of the tree of knowledge of good and evil: “In the day that you eat of it you will surely die” (Genesis 2:17). We all know what happened. Man rebelled, chose to disobey God, and the sentence of death was pronounced. Physical, biological death became dead certain for every person who has ever lived. Great men die. Obscure men die. Rich men and poor men alike die. “Sin came into the world through one man (Adam) and death through sin, and so death spread to all men, because all sinned” (Romans 5:12). Death, ultimately, has nothing to do with health or climate or geography or genes. Sin brought death, physically and spiritually. That’s why the Scripture speaks of two deaths (Revelation 20:14). The first death is when our bodies expire. The second death is the eternal death of the soul. The glorious good news of the Gospel is that Jesus Christ, who died and rose again, has alone defeated the dread enemy of death. Jesus, the Son of God, our Redeemer and Savior, bore our sins on the cross, suffered the punishment of our sins—death—on our behalf, and offers full forgiveness for all who trust personally in Him. As A.W. Tozer once remarked: “The once born die twice, and the twice born die once.” That is, those who have not repented of sin and turned to Christ will experience both physical and spiritual death. They will be judged by a holy God, found guilty of their sin and cast into the lake of fire. The person who has trusted in Christ for the forgiveness of sin will die physically, but not spiritually—his sins are atoned for by the blood of Christ. The wages of sin is death, but God’s gift of eternal life is free to all who believe on His Name (Romans 6:23). Everyone who believes in Christ is transferred from death to life (John 5:24). No one who believes in the person and work of the Lord Jesus Christ will perish (experience the second death), but will have everlasting life (John 3:16). Wherever Christianity flourishes, there is a vibrant culture of life, not death. When the precepts of the Christian faith are faithfully taught and followed, there is an abundance of selfless, sacrificial living and giving. For centuries, Christians have been at the forefront of saving and giving life. Mission hospitals around the world are beacons of light and hope in sin-sick cultures. Christian physicians, nurses and health care providers often forsake lucrative careers and even risk their lives to reach the poor and suffering. Churches around the world feed the hungry, clothe the naked and bring help to the helpless and hope to the hopeless. In places like Europe, where Christianity has been in decline as the deceptive forces of secularism and materialism have spread across the continent, it’s not surprising to find the practice of euthanasia so entrenched. Earlier this year, Belgium became the first country in the world to allow child euthanasia with no age limit. I’m concerned that America is not far behind. The euthanasia movement—disguised now as “death with dignity”—is gaining ground in a number of states. And for every 1,000 live births in the United States, 219 pregnancies end with a murdered child, through abortion. I don’t think there’s any doubt that this rise in the culture of death in our own country coincides with the embrace of an immoral, sinful, godless worldview that rejects Christ. Christianity is constantly under siege from the halls of government and education, which seek to suppress any public expressions of faith. Yet bold, biblical Christianity is the only antidote to the devilish, dark culture of sin and death that seeks to enslave and ultimately damn people for eternity. We must never cease to preach, teach and live the truth of the Gospel. Jesus Christ, crucified and risen is “the way, the truth, and the life” (John 14:6). ← Who do you follow, Jesus or Someone Who Proclaims to Know Him?